One of the easiest and quickest ways to access God's word is to keep it right near you -- on your night stand. Don't have a night stand, put it under your pillow. :) Having the word on your night stand is a quick way to grab and be intentional in making time to study the word. Whether your favorite time is early mornings or late nights, simply reach over and dive deeper into one scripture, journal it's application in your life, and pray/mediate on how you can walk out God's truth. We live in a technology driven world and many of us have smartphones so why not let them be used to drop some knowledge, God's truth, in our daily walk. Some of my favorites include the First 5 app by Proverbs31 Ministries, the Christian Standard Bible (CSB) app by LifeWay Christian Resources, and the Bible app by YouVersion. Just do a search in the App Store or on Google Play and you'll find a list of great resources. I encourage you to download one and carve out 5 - 10 minutes a day to read a devotional or or start a bible reading plan. Another great way to learn the God's word is to write it out and commit to memory through scripture cards. 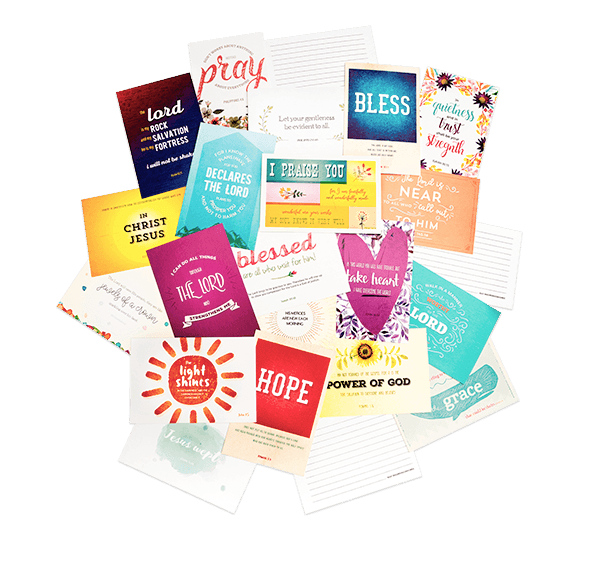 These cards can be used to capture scripture, life applications from your study time, inspirational quotes, or used to write out encouraging notes for yourself, family or friends. I love using the Hope Deck, a collection of 60 inspirational Bible verse postcards with custom artwork on every card. Whether you use post-it notes, handmade cards, or the Hope deck, these cards are great ways to capture your heart and to keep near you to always have God's word close. Remember, when you surround yourself in God's word it changes you - your heart, attitude, and atmosphere, all for the glory of God! What's your favorite way to spend time in God's word?